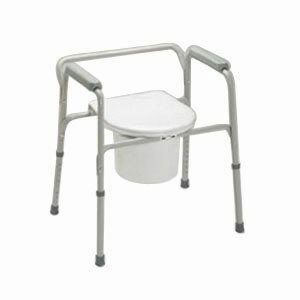 Ez-Care Aluminium Commode by Medline is mainly used by those who have difficulties in walking to the bathroom. These commodes are used bedside and can also be used as an elevated bathroom seat in the bathroom. Every commode comes with a pail guard. Commode is made of Aluminium and is easy to carry as Aluminium is light-weight. Easy to remove seat and cleaning would be easy. Can hold upto the weight of 350 lbs.